Governor Frank Morrison proclaimed Stromsburg to be "The Swede Capital of Nebraska" at the Swedish Festival in June 1966. In 1856, 155 people from Ockelbo, Sweden, sailed aboard the vessel 'Carolina' to a new life in America. After several years in Illinois, some of the people decided to move on to the state of Nebraska, with Swedish real estate agent Lewis Headstrom as their leader. Delighted that the landscape resembled their homeland, they chose to name their new town after Stromsborg, a section of Ockelbo, Sweden. The heritage and history of our town has been well preserved and has been used as a basis for the honest, wholesome standards kept by the community today. Buildings from �native� brick still standing are: The Viking Center, now a community center that was originally The Opera House; the Cornerstone Bank; two businesses on the east side of the square; and several homes. Brick streets still surround the city square in Stromsburg. The Buckley family, descendants of early settlers in Stromsburg Precinct, donated several acres of land at the south edge of town for a city park. The city has since then purchased more land to enlarge the facilities. Buckley Park offers free camping, a double ball field, tennis/basketball courts, a sand volleyball court, a swimming pool, two pavilions, a playground, and an area for picnics. This has become a favorite camping and tourist attraction. Another interesting feature is the Midwest Park Arboretum in the northeast part of Stromsburg. The arboretum has more than 75 different varieties of trees and plants, with more added each year. 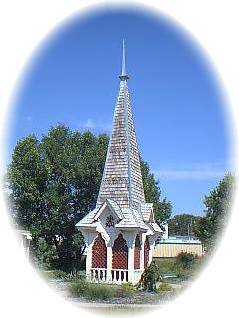 As a member-organization of the Nebraska statewide arboretum, it has an historical gazebo, the "Pioneer Couple" statue, and both playground facilities and picnic tables. Stromburg's Swedish Festival held on the third weekend in June, features authentic Swedish food, crafts, parades, and a multitude of activities for the over 10,000 visitors that attend. The Frawley Fountain has been the focal point of the City Square since the late 1800's. The fountain was placed on the east side of the park by J. A. Frawley and has been recently refurbished by his descendants. Held the 3rd weekend in June each year. Stromsburg looks forward to its 50th annual celebration in 2002.